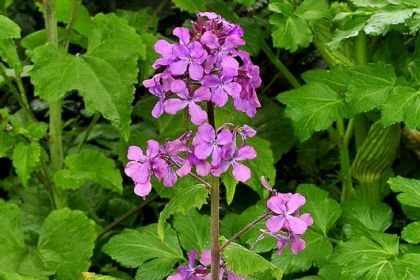 Honesty is not easily confused with other wild plants on this web site. This upright hairy plant, having escaped from its garden environment, has happily gone native and is usually found along hedgerows, banks, and waste ground. 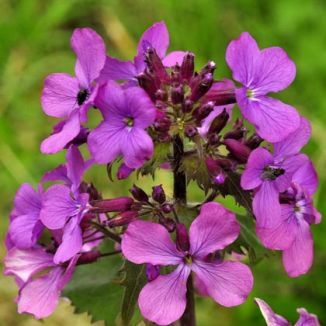 From April to June, it stands robustly, displaying a dense raceme of pretty magenta coloured 4-petalled flowers (25-30mm across) which are delicately fragrant and much loved by bees and butterflies. Reaching to 1 metre high at times, its leaves are heart-shaped, coarsely toothed, upper leaves being unstalked and the lower stalked. The distinctive part of this biennial is really its amazingly designed seedpods. The seeds are contained in oval shaped flattened pods (30-50mm across) which split when ripe, exposing their silvery translucent septums which remain on the plant for months. This plant is not a native and it belongs to the family Brassicaceae. My first record of this plant in a wild habitat rather than a garden was near Ballymitty, Co Wexford in 2007 and I photographed it on that occasion. This plant is also known as Silver Dollars and Pope's Coin and is much prized by flower arrangers when it is at the seedpod stage. Honesty is one of the larval foodplants of the Orange-Tip butterfly.